I was thrilled to get a note from Snooth asking if I wanted to participate in a virtual tasting of the wines of Dona Paula. The virtual tasting series is wonderful and informative. Unfortunately I missed the event because work got in the way – imagine that but I did taste the wines on my own and really enjoyed them. 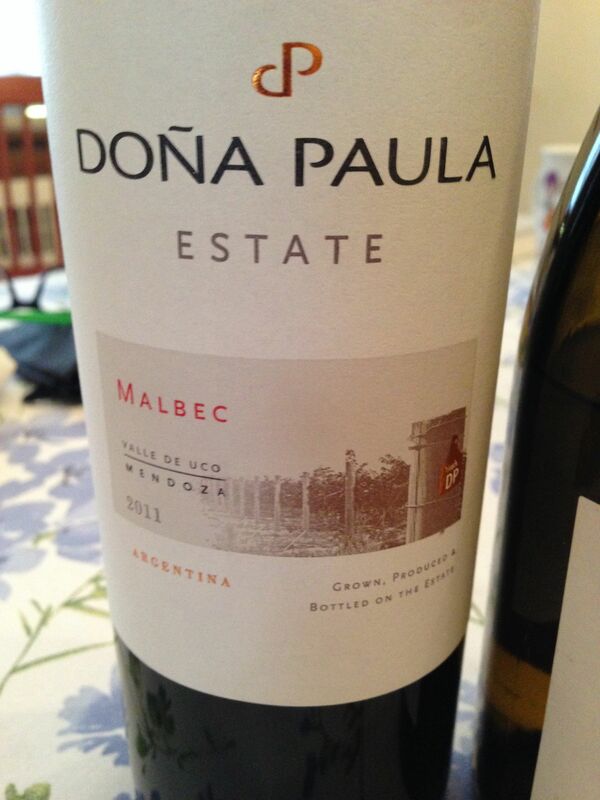 Full disclosure, I have visited Dona Paula in Argentina so I was already well disposed to try the wines. My visit in 2007 was part of a longer visit to Argentina, although not long enough. This time around the setting was different, I was at home eating grilled salmon and tasting the Torrontes 2011 on a Sunday in November. I was very pleasantly surprised. Surprised because the Torrontes had a lot of intensity and structure. I don’t drink Torrontes that often and I had forgotten how a beautifully made one can be – floral and fruity, structured with clean acidity. 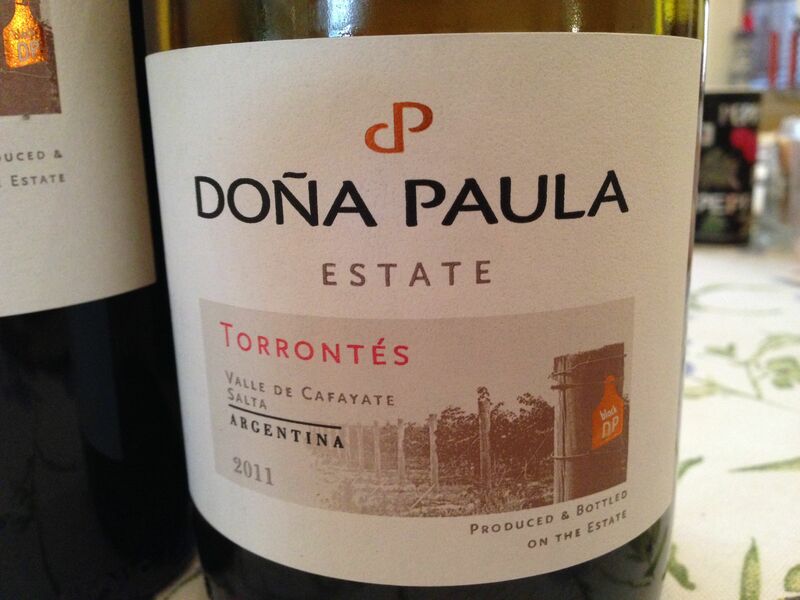 Torrontes in general hails from the North of Argentina, specifically Salta in the Cafayate Valley. It is grown at 1700 meters above sea level. Soils are said to be rocky and sandy. According to their website, the “grapes are gently destemmed while SO2 is added to avoid oxidation. The juice is separated from the skins, without pressing, and fermented in small concrete tanks at low temperatures.” I also find it very interesting that this wine is made from three different harvests, meaning they pick some parcels of these grapes in February, others in March and a third time in April. The lots are then blended I assume although this wasn’t spelled out on the website. I really enjoyed this wine which unbelievably is only $12-15 in a host of stores.. Click here . I also tasted the Malbec Estate 2011 which is made from grapes that grow in Tupungato, Uco Valley and in Altamira, Uco Valley. The vineyards in these locations are also at a high altitude, 1,350 meters and 1,150 meters, respectively. For a Malbec, I did find surprising minerality which I assume is because of this altitude. Yes it was soft and plushy as many Malbecs are but it was also nicely balanced which I find many Malbecs are not. For $13-$15 this wine was also a great value. Both are perfect wines to bring to a holiday party and will be crowd favorites. Earlier this year, I attended a press conference where Ambassador José Luis Pérez-Gabilondo, the Consul General of Argentina in New York, said that Argentina was, for the second consecutive year, the 4th largest exporter of wines to the U.S., both in terms of volume (with more than 61 millions of liters) and in terms of value (with exports reaching $297 million). Income from wine exports increased to $741 million in 2012 with Malbec a key contributor to this overall growth. Argentina has 1300 wineries and is the fifth largest producer of wine in the world. Argentina’s signature grape arrived in the country from Cahors in France in 1853 thanks to Michel Aime’ Pouget, an agronomist who was hired by the President to run the Quinta Agronomica de Mendoza. I’ m the responable of the vineyards of Doña Paula. I’m really happy to see that you enjoyed the wines. Concerning Malbec its minerality is due to the altitude (mainly Alluvia vineyard), but also to the high calcium carbonate of the soil where this vineyard are planted. I hope some day to have you come back to Argentina. I would be very pleased to receive you. Best regards. Thanks for reading my post and the information on minerality. I would love to visit Dona Paula again in the future. Again, compliments on your wines.